How a diverse, global group of influencers and innovators came together—despite wide differences in experience and expertise—to develop a truly shared roadmap for their movement. Open contracting is the idea that governments can reduce corruption, foster entrepreneurship, and improve people’s lives by increasing transparency and accountability in public procurement—the process by which governments spend money for goods and services. Open contracting is a rising movement in the open governance world, and in 2017, more than 200 experts and innovators gathered to align on a vision for its future at “Open Contracting 2017.” The consortium behind the convening, including the Open Contracting Partnership, engaged Reboot as a design and facilitation partner in order to bring our expertise in movement-building to energize and focus the momentous meeting. We started by engaging with participants, conducting a survey as well as one-on-one interviews, and then synthesized their diverse goals and expectations with those of the conveners. Through a design workshop with the conveners, we co-created the meeting agenda, balancing hands-on working sessions, practical idea exchange, and unstructured time for networking. We then facilitated the event with an adaptive and flexible touch, maintaining the balance and energy throughout two packed days. The result was a vibrant gathering that exceeded participants’ expectations. A diverse group of participants co-created a shared forward vision and developed concrete initiatives, which partners are now pursuing. Governments around the world spend trillions of dollars a year through contracts, on everything from buying office supplies to building airports. These contracts—known as public procurement—are a top source of corruption risk. But they’re also a huge opportunity, as fair and transparent government spending can foster entrepreneurship and deliver high quality goods and services to improve people’s lives. That’s the idea behind “open contracting,” a movement at the cutting edge of open government; proponents of open contracting encourage the publication and use of open, timely data on government spending. Like many new and visionary ideas, open contracting is a movement of diverse actors, with different stakes in and different viewpoints on public procurement. That’s why a consortium of partners—the Open Contracting Partnership, Hivos, CoST, B Team, Article 19—decided to host a global convening, “Open Contracting 2017.” Their goal was to articulate the current state of open contracting, and to develop a shared vision for where it’s going. With more than 200 participants from 37 countries planning to attend, the consortium engaged Reboot as a design and facilitation partner for this milestone meeting. Influencers and innovators attending Open Contracting 2017 came from a wide variety of backgrounds, including government, the private sector, civil society, media, academia, large international NGOs, and donor organizations. Respecting and balancing these actors’ diverse goals was a cornerstone of our approach. Through deep participant engagement ahead of the meeting, we were able to create and then lead a dynamic and productive agenda that upended traditional power dynamics and allowed the generation of new ideas and collaboration. Because five organizations—each with its own perspective—were hosting Open Contracting 2017, we started by leading a workshop for the conveners to align and articulate their goals. We then delved into the goals of participants, using a survey of 100 people as well as one-on-one follow-up interviews. These exercises revealed the places where the conveners and the participants had shared goals, such as the desire to “take home stories to help them make the case for open contracting.” We also uncovered potential challenges, mostly centered around the conveners’ broad visionary goals and the participants’ immediate, practical needs. This foresight enabled us to create an agenda that would serve all involved. Personal connections are the most valuable part of any event—but when a conference is stacked up with PowerPoints, those connections only happen over coffee breaks. 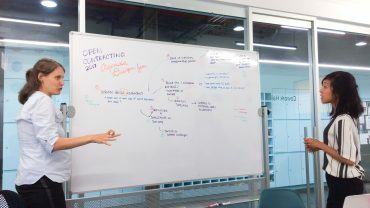 Reboot ensured participants at Open Contracting 2017 built ideas, skills, and their networks by integrating conversation and small-group time into the agenda. Informed by participant input and co-created through a workshop with conveners, the agenda held the right mix of ice-breakers, expert panels, working design sessions, and informal open time. In facilitating the two-day convening, we watched what worked and updated what didn’t, responding to the needs and energy of participants. Like many innovative ideas in governance, open contracting may seem like a problem with only one dimension—as if opening data and documents about spending is, on its own, enough. But to truly level the playing field for private companies and to keep procurement transparent and accountable, open contracting must be a change process. This was a major theme to emerge from the convening. Participants agreed that the future of open contracting is in going beyond opening data, to opening systems and processes and creating long-term change in power structures. Within this broad, visionary insight, participants shared and learned specific tactics and practical strategies for moving forward in different contexts, including everything from litigation to grassroots empowerment. In the post-event feedback survey, 94 percent of participants said the event either met, exceeded, or greatly exceeded their expectations. One evaluator said, “I got the impression there was a lot of passion and care in the design of the conference and sensitivity to try to include all that was demanded by the audience. I really liked the space in the agenda for the deep dives.” And the impact extends beyond the event—due to strong relationships forged and creative co-design exercises we led, nearly 90% of initiatives proposed at the event were carried forward into implementation by different coalitions of partners. For example, the organizations B Team, Invest in Africa, Hivos, the World Economic Forum, Safaricom, and other partners are working on a pilot project in Kenya to mobilize private sector support for open contracting. Today, Reboot continues to support the global open contracting movement, working with governments and civil society groups from New York City to Nigeria to realize accountability in public spending.